So the majority of the bed is full of shallots, multiplier onions, and elephant garlic at the moment. (For more information on the garlic and shallots, go here.) There is about 5 feet at one end where we had some lettuce last fall. In that open space, we will be planting two types of bush beans: Amethyst (purple) and Jade (green). Everything in this garden should be ready to harvest/remove by sometime in July. 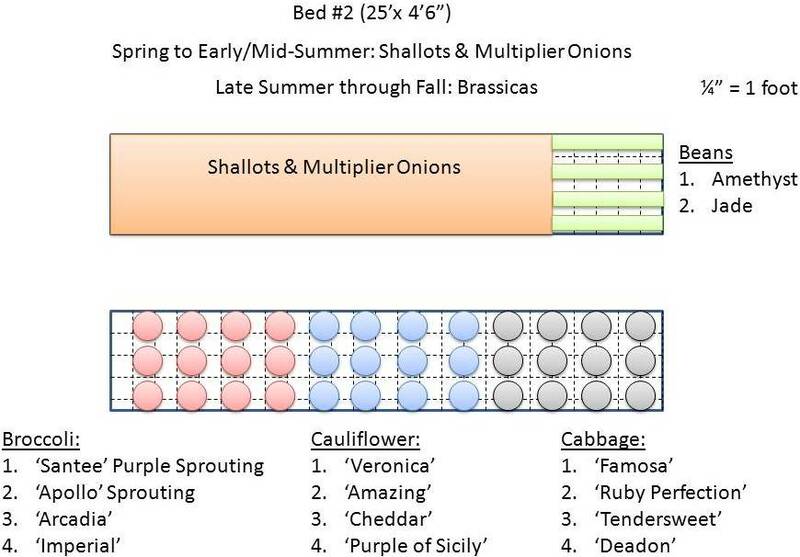 For the fall, we are going to plant 4 varieties each of broccoli, cauliflower, and cabbage. We will start the plants from seed indoors in late June with the plan to plant them out in the garden in late July or early August (weather dependent). Here’s a little more information about each variety. Both ‘Santee’ and Apollo’ are sprouting broccolis, meaning that they do not produce one large head, but rather a lot of smaller side shoots. ‘Santee’ is a purple variety. ‘Arcadia’ and ‘Imperial’ are both regular broccoli varieties, but varieties that are supposed to be very cold tolerant and do well in fall plantings. ‘Amazing’ is our white cauliflower selection. We chose it because it is supposed to do well in the fall and is fairly short days to maturity. ‘Veronica’ is a green, romanesco type cauliflower. ‘Cheddar’ is an orange cauliflower. ‘Purple of Sicily’ is…you guessed it! A purple cauliflower! We have two savoy cabbage and two regular cabbage. ‘Famosa’ is a savoy (crinkly leaved) green cabbage and ‘Deadon’ is a savoy with red and green leaves. ‘Tendersweet’ is a regular green cabbage and ‘Red Perfection’ is a regular red cabbage.